The first authoritative biography of one of the 20th century’s foremost ornithologists, whose 1934 Field Guide to the Birds was one of the two foundational books that launched the environmental movement. Beginning with his 1934 Field Guide to the Birds , Roger Tory Peterson introduced literally millions of people to the pleasures of observing birds in the wild. His field guide, which has gone through five editions and sold more than four million copies, fostered an appreciation for the natural world that set the stage for the contemporary environmental movement. When Rachel Carson's Silent Spring sounded a warning about the threat to birds and their habitats in the 1960s, the Peterson field guides had already prepared the public and the scientific community to heed the warning and fight to save habitat and protect endangered species—a result that Peterson wholeheartedly approved. In this authoritative, highly readable biography of Roger Tory Peterson (1908-1996), Douglas Carlson creates a fascinating portrait of the complex, often conflicted man behind the brand name. He describes how Peterson's obsession with birds began in boyhood and continued throughout a multifaceted career as a painter, writer, educator, environmentalist, and photographer. Carlson traces Peterson's long struggle to become both an accomplished bird artist and a scientific naturalist—competing goals that drove Peterson to work to the point of exhaustion and that also deprived him of many aspects of a normal personal life. 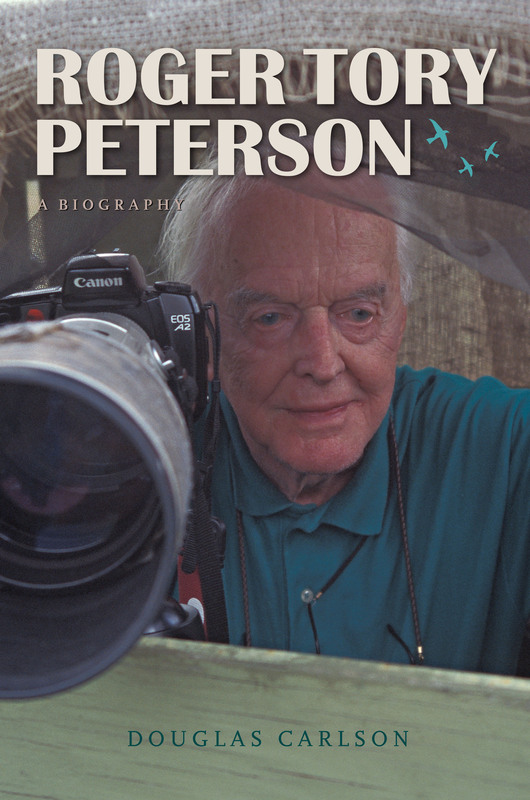 Carlson also records Peterson's many lasting achievements, from the phenomenal success of the field guides, to the bird paintings that brought him renown as "the twentieth century's Audubon," to the establishment of the Roger Tory Peterson Institute to carry on his work in conservation and education. Douglas Carlson is a retired professor of English who has written extensively about the natural world. A longtime resident of the Jamestown, New York, area where Roger Tory Peterson grew up, Carlson also lived and taught in Minnesota before moving to Athens, Georgia, to work on the Georgia Review . "Birds have occupied my daily thoughts, filled my dreams, dominated my reading." With these words from a speech delivered in Houston two years before his death in 1996, Roger Tory Peterson summed up a life given over to an obsession. Although friends and colleagues tell of a man who was generous, funny, and kind, Peterson did, indeed, live in a world apart. All of the people interviewed for this project would link Peterson's monumental accomplishments to his "focus." He was a complex man, plagued with self-doubt, but somehow excelling in the often-conflicting cultures of artist and naturalist. Yet his letters reveal his own brand of humility; in spite of honors and accolades, he always deferred to birds. In the thousands of letters in the Peterson correspondence housed in the Roger Tory Peterson Institute of Natural History, personal references are uncommon, and when they do occur, they usually appear within the context of his work. When he began work on his autobiography, which was never completed, he planned to avoid the details of his personal life and focus, rather, on his life with birds: writing about bird people, bird adventures, bird population shifts, changes in the bird-watching world. His work was his life. His outlook, however, was not so narrow as might be expected. By temperament he was a world citizen, interested in cultural as well as natural history. What he called the "environmental ethic," which he expanded to include the "humane ethic," provided the link. As he explained in the Houston speech, "Watching birds has sharpened my senses, made my hearing more acute than most, my eyes more perceptive, my reactions quicker. This awareness radiated far beyond the birds, embracing nearly everything that is alive, from my fellow humans to the least beetle or cricket." It engendered "a reverence for life." Nevertheless, a subject's reticence to talk about private things makes a biographer's task more difficult. And this reticence is compounded by the nature of Peterson's prolific writing career. As his younger son, Lee, points out, Peterson was a great assimilator of ideas and a lover of phrases that encapsulated these ideas. For example, after his friend James Fisher coined the phrase "birds are the litmus paper of the environment," it appeared in countless Peterson articles and speeches. And because of the focus of his life, he wrote on a narrow range of topics. Thus, at the very essence of his published work, despite its excellence there is a sameness. Stories and catchphrases reappear regularly over the decades. The same can be said of his correspondence. Fortunately for those of us interested in a deeper understanding of the "personal" Peterson, he was a man of passions, given to powerful statements when moved. And as a man given to moodiness, he was often moved. Therefore it may be assumed that his personality was, in some ways, rather transparent. Readers are welcomed to share in this assumption, and to share in the intriguing process of analysis. Personality, however, must be secondary here. While this book employs the obvious organizational devices of time and place, each section examines the varied facets of Peterson's remarkable career: as painter, writer, teacher, and environmentalist. Taking a cue from Peterson's autobiography plans, the emphasis here is on a body of work that spanned nearly the entire twentieth century. Because his death is so recent, there are many who have a personal investment in his story; beyond a request for an interview, no attempts have been made to invade the privacy of any of them. Through Peterson's painting and writing, and in the work of the Roger Tory Peterson Institute, the truths of his life are revealed. In a lifetime, it is a fortunate person who has one good idea. Roger Tory Peterson had one. It grew into A Field Guide to the Birds , which was published in 1934 and became one of the most important and influential books about the natural world written in the twentieth century. When Peterson died in 1996, tributes focused on the three ways that his Field Guide had led a large segment of American society into the green movement of the century's last decades. David Clapp, a director of sanctuaries for the Massachusetts Audubon Society, suggested, "Those field guides opened a door and, culturally, all of America has walked through it. By becoming aware of birds, we essentially opened up all of our environmental thinking." Clapp was referring to an awareness that there were more types of birds than just crows, robins, and little brown ones. The guide encouraged a closer look by rewarding it. Since the guide made the names of birds accessible, awareness turned to knowledge—knowing the names of things, an essential step toward involvement. According to ornithologist Noble Proctor, "It was his [Peterson's] field guides that really started the conservation movement. Through his field guides, people obtained the knowledge to identify the plants and animals and birds. That really is the foundation. Before you can go out and save anything, you have to know what it is. His field guides did that." Finally came concern. As Frank Graham Jr. wrote in Audubon Magazine , "Rachel Carson's Silent Spring may have jolted Americans into the Age of Ecology in the 1960s, but they had been prepared for the transition by a succession of Peterson field guides over the previous three decades.... By the time Carson revealed the extent of the threats to wildlife, millions had already been primed by Peterson to defend the natural heritage that he had helped them know and cherish." In other words, Peterson's contribution was to change the way his readers saw the natural world, to establish and prepare an audience for the David Browers and Ralph Naders—activists and polemicists who were trying to save it. And along the way, Peterson changed bird study from a rich man's pastime into a hobby for anyone. Peterson's good idea began in the loneliness of his childhood in Jamestown, New York. The facts of his early life are rather typical for a first-generation American. His father, Charles Peterson, came to this country from Sweden as an infant and was sent to work in the mills by the time he was ten, when his own father died of appendicitis. He eventually earned his living as a traveling salesman. Peterson's mother, Henrietta Badar, came to the United States from Germany at age four and grew up in Rochester, New York. She attended a teachers' college and was teaching in Elmira, New York, when she met Charles. The couple married and moved to Jamestown, a small industrial city in the far southwestern corner of New York State, where Charles took a job in one of the city's numerous furniture factories. Roger Tory Peterson was born there on 28 August 1908 and grew up in the chaos of his maternal grandparents' home, living with his sister, Margaret, and as many as six cousins off and on. His parents played out typical early-twentieth-century gender roles, and Peterson clearly favored his mother. Charles Peterson was a Democrat; his wife was a Republican. He thought churches were filled with hypocrites; she taught Sunday school. He liked his schnapps; she objected to his drinking. The father administered the punishment, earned what money he could, and scorned all things impractical. The mother nurtured, kept house, took menial jobs to help pay the bills, and was unwavering in her support of her son. She took him to the Lutheran Church, where he was baptized and confirmed. "This gave me a rather structured life," he would write later, "but it also put the fear of God into me and made me feel rather guilty about having too much fun." Barbara Coulter Peterson, who was married to Peterson for thirty years, recalled that he seldom spoke of his childhood, relieved to put it behind him. She was able to infer, however, that it was "grim." He was in constant conflict with his father, who may have had a drinking problem and whose factory job wasn't sufficient to feed the extended family. In 1943, Barbara wrote a letter to her mother, announcing her plans to marry Peterson and making some observations about him. In it, she mentions the poverty of his youth: "He shows, I think, the effects of malnutrition. He tells sometimes of not having enough to eat." However, Peterson saw it from another angle. After he received the Horatio Alger Award, he said that he had never realized that he had been deprived as a youth. "I thought the other kids were deprived—I had the birds." "As a boy," Peterson remembered, "I found my most faithful friends in books." And that's where his idea began—with one of his books. Most of his classmates had little use for him. He was younger; he managed to skip a grade and entered high school when he was twelve. "For some reason," he wrote, "I was able to skip the second grade. Why, I have never known, because I gave no evidence of brilliance, unless my habit of day-dreaming was misconstrued as perception. I suspect that skipping a grade did not help me any. I never quite caught up with my classmates and rebellion was inevitable." In fact, he lacked those attributes that privilege a school child: athletic ability, good looks, social graces. And he was obsessed with nature study—which branded him, as he recalled later, a "kook." The book Peterson drew his idea from was called Two Little Savages , written in 1903 by Ernest Thompson Seton, a promoter of nature studies who also coauthored the first Boy Scout manual. In the book, Seton had tapped into the turn-of-the-century fashion of appropriating American Indian culture as an example of an untarnished connection with the natural world. The main character, Yan, could have been Roger Peterson; he is enthralled with nature and wants nothing but to learn all about it and escape into it, which he does by learning Native ways. Instruction in nature studies, from how to identify leaves to how to build a tipi, is embedded within a loose narrative. One story tells about how Yan learned to identify ducks; it's a story that Peterson retold in numerous interviews and articles. This is how it appears in the preface to the 1934, 1939, and 1947 editions of the Field Guide : "This lad had a book that showed him how to tell ducks when they were in the hand, but since he only saw the live birds at a distance, he was frequently at a loss for their names. He noticed, however, that all ducks were different—all had little blotches or streaks that were their labels or identification tags. He deduced then, that if he could put their labels or 'uniforms' down on paper, he would know the ducks as soon as he saw them on the water." The hero finds mounted duck specimens and makes sketches of them with their patterns. Seton included two pages of what he called "far-sketches" of ducks; they look strikingly similar to Peterson's renderings in the early editions of the Field Guide . But the drawings alone would not have been enough without the passions that Peterson and Yan shared—for the natural world and its implicit freedoms. In speeches and articles, Peterson would trace the roots of that passion to his seventh-grade teacher, Blanche Hornbeck. In the often-told story, Miss Hornbeck started a Junior Audubon Club that met after school. For a dime, students received a monthly packet containing a bird leaflet, usually written by Dr. Gilbert Pearson, president of the National Association of Audubon Societies at the time; a bird portrait by Bruce Horsfall, Allan Brooks, or Louis Agassiz Fuertes; and a bird drawing to color. The one activity that Peterson remembered best was when Miss Hornbeck gave the students a watercolor box and a Fuertes color plate to copy from Eaton's The Birds of New York State . He was given a blue jay, and he claimed that from then on, he wanted to be a bird painter. Peterson and Miss Hornbeck would rediscover each other in an exchange that clearly reveals his sincerity concerning the importance of the Junior Audubon Club and provides a rather touching footnote to the story. In 1950, Miss Hornbeck read a magazine profile of Peterson in which he acknowledged his debt to her. She wrote him enthusiastically to say that she had discovered "that a former pupil was the great and honored Roger Peterson!... My joy and satisfaction in your wonderful achievement is unlimited and I am more happy than I can tell you to have played some small part in helping you to discover your life's work." She remembered a rainy morning bird walk when she expressed surprise that anyone came. "I can still hear you say, 'You can count on me, no matter what the weather.'" Peterson sent her two inscribed books, including his collection of birding recollections, Birds over America , which prompted her to write about her joy in "participating vicariously in events which I would like to have had." Peterson continued to send books to her until he learned of her death. We came across a flicker, just a few feet off the ground on the trunk of a tree. Its head was tucked under its wing coverts. It was probably exhausted from migration, but we thought it was dead. We stood and stared at it for a while, examining its beautiful plumage. When I reached out to touch its back it exploded with life—a stunning sight, flying away with its golden underwings and the red crescent on its nape—I can see it now—the way it was transformed from what we thought was death into intense life. I was tremendously excited with the feeling which I have carried ever since, of the intensity of a bird's life, and its apparent freedom, with this wonderful ability to fly. It is easy to see how such an experience could have so profound an effect on a sensitive and searching youth. Interestingly, however, this passion for birds began to wane after a year or two and was replaced by a love for butterflies and moths. One reason was Peterson's natural curiosity and desire to learn everything about the natural world. Another might be a simple need for companionship. As he wrote later, catching butterflies and moths was something he could share with buddies, who liked it "especially around the streetlights adjoining the cemetery." One of these friends, Clarence Beal, was to become a friend for life. As Beal remembered, "Roger was definitely an entomologist at that period back in 1922 or 1923 when I first began hiking with him through the hills." In trying to understand the powerful hold that the natural world had on him as an adolescent, Peterson often implied a need for sexual control. In an unpublished manuscript Peterson told a story about capturing his first luna moth, a creature that epitomized to him "everything that is fragile, elusive, and ephemeral." He netted it and examined his catch. "Nothing I had ever seen before—bird or butterfly—could match the evocative, breathtaking beauty of this, my first luna," he wrote. And it is remarkable: a pale green collection of shapes and curves that seems to float like a wind-borne leaf rather than flying. Years later, Peterson revisited the event in a dream—exactly as it happened, except that when he peered into his capture net, he saw "a delicate, nymphlike creature. I cannot remember whether it had wings, but it (or she) was quite naked." In Peterson's take on the dream, he wondered: "Could it be that the symbolism of butterflies (and moths) is rather like that of Rima in Hudson's Green Mansions —an adolescent dream of maidenhood—not of flesh and blood womanhood, but an elusive gossamer and floss vision to be pursued and, hopefully, possessed." In a 1983 interview, he suggested that boys have a special "male-oriented" interest in bird-watching and spoke of birds in a similar way: "a vision of something possibly unattainable but which should be pursued and if possible captured, much the same as a boy regards a girl." What better tool for such a pursuit than the camera, with its ads that invite you "to capture the moment"? Soon after his bird infatuation began, Peterson saved enough money to buy his first camera. He was fourteen. The camera was a Premo No. 9, a drop-bed view camera that used glass plate negatives. It had an expandable bellows that opened when the front of the camera was lowered, and the photographer looked into a viewfinder on the top. Although it could be handheld, it was used primarily on a tripod. Besides camera and tripod, Peterson would have to carry the four-by-five-inch glass plates to the site, expose them, then haul them back to a darkroom at his cousin Allen's house. In a bird study journal Peterson kept when he was fifteen, called "Fourth Year of Bird Study," he mentions bringing his camera on many walks and writes about the satisfaction and frustration of his newfound obsession. Some of the difficulty can be seen in an entry about trying to photograph a goldfinch at one of his feeders. The plan was to aim the camera at the feeder, tie a string to the shutter, hide behind a bank, and wait for the bird. But the shutter got tripped accidentally; a new glass plate had to be loaded; then the bird didn't cooperate; and so on. Capturing a bird on film in 1922 took time, effort, patience, and a tremendous desire. The photographs that Peterson made in those early days were true captures. Given the limitations of his equipment, they simply record the birds. Some of the early exposures made around his home are housed in the Roger Tory Peterson Institute in Jamestown; the birds in them are identifiable, but the pictures show no awareness of composition or light and dark values. Yet they were something to hold, to pore over at night, to possess. Even in these post-Freudian times, it's hard to resist an interpretation of a boy's suppressed desires channeled into love for his natural surroundings. Another attractive reading, however, allows for a gathering of natural passions incubating in a naturally passionate man. These passions formed Peterson's expressive side, which found a voice, to a greater or lesser degree and at various periods, in his work. In his early obsession for birds, however, it was dominant. As he wrote in Birds over America , an often-autobiographical collection of essays about the avocation of bird study, "In my teens, the mere glimpse of a bird would change my listlessness to fierce intensity. I lived for birds. It was exciting just to see them move, to watch them fly. There was nothing thoughtful or academic in my interest; it was so spontaneous I could not control it." Opposing this expressive side was another combination of influences—of early twentieth-century cultural demands placed upon young males and, more important, the expectations of Peterson's father. Charles Peterson was an immigrant who was accustomed to hard work—according to Roger, a "properly puritanical Swede," who had no sympathy for his son's impractical interests. Peterson wrote little about his father, and when he did, it wasn't complimentary. His reconstruction of a childhood scene in an autobiographical chapter from Birds over America probably accurately portrays the relationship: "'So you've been out after birds again!' my father snorted. 'Haven't you seen them all before? And look at your clothes—nobody with any sense would stay out in the rain.' Puzzled, he shook his head. 'I swear, I don't understand you,' he added reproachfully." The tension in the Peterson house was understandable: a father who had worked since he was ten years old had a son who shunned everything else to chase butterflies, study wildflowers, and watch birds. And it is clear that Peterson was completely absorbed by birds. His prized possession was a pair of four-power binoculars he bought with his paper-route money. His "Fourth Year of Bird Study" journal holds records for almost-daily bird walks. It also contains his list for the year (153 species), where each bird was first seen, and the second spring arrival date. There's a nesting survey and diary entries that include attempts to translate birdsongs into language—something he would do to great effect in his field guides. Each winter he maintained a string of feeding stations on the outskirts of town with his friend Clarence Beal. He would fill them each morning before school and then take his camera in the afternoon to photograph the chickadees, nuthatches, and other feeder birds that visited. During all this, he somehow found time to establish a bird network called the Nature Correspondence Association, which grew eventually to about sixty members in seventeen states. With three other young birders, he produced a biannual publication, The Passenger Pigeon . Gustav Swanson, one of the charter members and later the head of the Conservation Department at Cornell University, recalled that Peterson did a line drawing of a passenger pigeon for the cover and led the effort to contribute notes and articles about birds. While I was walking along the railroad track I caught a faint strain of bird melody. The wind was strong, hushing most all the music of the commoner birds so that one had to listen very intently in order to catch their notes. It came from the side of the hill by the wilderness road. I listened again to the wild sweet strains. It was undoubtedly a hermit thrush. I went carefully up through the woods, but I could not exactly locate the sound. Sometimes it seemed farther up the hill, again to one side, and lastly I ascertained that it came from the direction I had just come. I saw a bird silently fly up from the ground, its rufous tail plainly telling that it was a hermit thrush. It well deserves its name, for in truth no other bird seems so solitary. It walks among the leaves robin-like, hunting for insects, or flying into the low branches of a small hemlock, makes an occasional 'chuck.' It need not be confused with the fox sparrow, the size is larger. The tail is not so bright, while the back is a uniform drab color, or olive brown, in contrast to the fox sparrow's striped chestnut and gray back. The chief difference is in the breast. The hermit's breast is distinctly spotted in the manner of the wood thrush, while the fox sparrow is blotched and striped with chestnut brown. Obviously when he wasn't watching birds, Peterson was thinking, reading, and writing about them. Entomology continued to absorb him as well. His moth study was hindered by an 8:45 p.m. Jonestown city curfew, so, Peterson recalled, he went to city hall and explained the problem to the chief of police, who wrote a note permitting Peterson and his "assistant, Benny Shapiro, to catch moths around street lights until 11 p.m."
In 1942, Peterson's good friend Edwin Way Teale gave Audubon readers a sense of what it was like to have a young Peterson around the house. According to stories Peterson told Teale about himself, he pressed hundreds of plants by placing them between newspapers and slipping them under the carpets. That winter he brought home several hundred promethea moth cocoons, which emerged and laid eggs in his mother's curtains, gluing the egg clusters to the curtains with a brown secretion. And in an unpublished piece, Peterson recalled an irruption of pipevine swallowtails, a species normally found in small numbers that far north. Entranced, Peterson collected eight hundred (by his estimate) caterpillars. They eat Dutchman's-pipe, a vine native to areas south of western New York but common as an ornamental in Jamestown. As a result he spent hours sneaking onto porches all over Jamestown, stealing leaves to feed his caterpillars. But ultimately it was the world of birds that engaged him. He continued to haunt the woods and fields around Jamestown, and with Beal, he rode his bicycle to the outlet of Chautauqua Lake, which remained open in the winter, to watch ducks and on longer trips of twenty-five miles or more to the ravines of Chautauqua Gorge. And they saved their pennies to take the trolley to the Lake Erie shore. The gateway to all this birding came from Bird-Lore magazine, the popular bird publication of the day. It is easy to imagine Peterson poring over each issue, leaving Jamestown behind for the virtual bird world that the magazine offered. And through its pages, he was introduced to the more scientifically inclined elements of bird study. In a letter to Bird-Lore in 1924, he wrote, "I have become interested in the magazines, 'The Auk,' and 'The Condor.' I would like to subscribe to those magazines but I do not know where to send." This interest in professional bird journals indicates that he had quickly outgrown Bird-Lore 's cute, anthropocentric articles about "adopted" wild birds that were inevitably named and given human attributes. For him, the magazine's fact-filled educational pieces by Gilbert Pearson and Arthur Allen were more appropriate. And writing about Bird-Lore as an adult, he would remember editor Frank Chapman's notes on bird plumages and the migration data compiled by Frederick Lincoln, material that he eagerly memorized. Meanwhile, his artistic side was being nourished by the frontispieces—full-color bird portraits by his boyhood idol Louis Agassiz Fuertes and others. He was so enthralled by Bird-Lore that when his class was asked to make believe they were the persons they most admired, Peterson eschewed world leaders and athletes, pretending he was Gilbert Pearson and delivering a lecture on bird protection. There was fodder for planning and dreaming as well. In 1922, Frank Chapman wrote a short piece that set out the "requirements of the profession of ornithology." Among them was "an inborn love for the study of nature with so intense an interest in birds that they, more than any other forms of life, demand one's attention." Here Peterson could surely see himself and allow his imagination to dream a different life, as he often did. In this context, Chapman's words become prophetic. He describes the advantages of ornithology as "opportunity to follow one's chosen calling; to gratify an insatiable desire for research; to make work play; and, whether indoors or out, daily to renew one's joy in life." And his accounting of the service an ornithologist might provide outlines the life Peterson was to lead. The ornithologist is "limited only by one's belief in the value to man of contact with Nature and by one's ability to prove that Nature's beauty, joy, and freedom are most eloquently expressed in the lives of birds." Such pronouncements would satisfy Peterson's will to believe and would provide his thoughtful nature with an abstract sense of the rightness of what he was doing. They were, in his conflict with his father, words to live by. As I was reclining on the ground in a woods 6 miles southwest of Jamestown, I became aware of an unusual voice among the wave of Chickadees, Creepers, and Warblers that was passing at the time. My ears detected a distinct Peto-peto, so I jumped to my feet, all alert, for I had read that this was the call of the Titmouse.... Among its numerous notes... I found that its whistled, here-here-here-here was easiest to imitate. It was not long before I had enticed it within 4 feet of me by imitating its call. And it closes with the necessary contextual information that this was the third record of a titmouse in Chautauqua County. Peterson must have been ecstatic over his emergence into the ornithological world; what the elder Peterson thought of it can only be assumed. The more the father criticized, the more recalcitrant the son became. But it seems that rather than being malicious, the elder Peterson was simply acting as most fathers of his time would; he was mostly interested in Roger's getting ahead, making a good living. According to Beal, Charles Peterson once "accosted" his son's mathematics teacher on the street, insisting that "the teacher speak to Roger, showing him the futility of a career based on bird study." The teacher promised he would, but he never did. Beal himself was asked to intervene, but since he was smitten with nature study himself, it was a pointless request. And while the father professed no interest in his son's hobbies, he did offer occasional support. One recollection by an acquaintance has the elder Peterson smashing Roger's jars of butterflies and moths and throwing them away. But Margaret Peterson Lager, Peterson's younger sister, tells of her father making "exquisitely mitered display boxes" for Peterson's butterfly and moth collection and fabricating steel storage boxes for his negatives. She also tells of her father proudly carrying around the note signed by the chief of police that permitted Peterson to stay out past curfew to collect moths.